ATLANTA, Ga. (June 21, 2017) : The Peace And Love Academic Scholarship, Inc. (PALAS, Inc.) was recently recognized for their philanthropic work in investing in Jamaica’s children education at the People Profile Charity of the Year Award on June 18. The Award, founded by Dr. Allan Cunningham, recognizes ordinary people doing extraordinary things was held at Bailey Hall in Florida. Founder Ruel ‘Rula’ Brown is thankful for the recognition and honour, but already his mind is ticking away trying to garner funds to award at least 100 scholarships from the over 300 applications received in 2017. 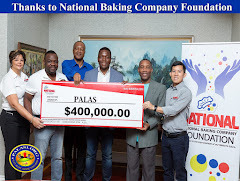 “I am truly elated and excited for PALAS, Inc. winning the 2017 People Profile Charity of the Year Award as this will provide more opportunities for the well deserving students by creating awareness to potential donors,” said Brown on the victory even as he went into campaign mode for more funding. “Due to the more than 300 high school and college applications received, funding and sponsors are still being sought for the 2017 season, so we encourage interested persons to donate via PayPal at www.PALAS1.org,” is the appeal coming from him.